Tranquility at the edge of San Diego Bay. Relax, take stroll, picnic, absorb the picturesque views and listen to the sounds of an active harbor and marina. Watch ocean-going vessels pass under Coronado Bridge. The park is great place to take the entire family after a day of exploring the Embarcadero. 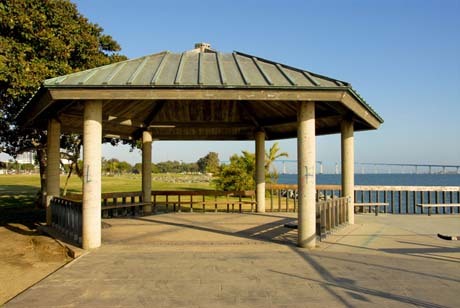 The amenities include shade trees, lush landscaping, bike path, exercise stations, gazebo, picnic tables, concession stand, convenient parking and a gentle ocean breeze. Sometimes you might even catch a public event or festival at the park such as Wine Festival and the Fine Art Festival. 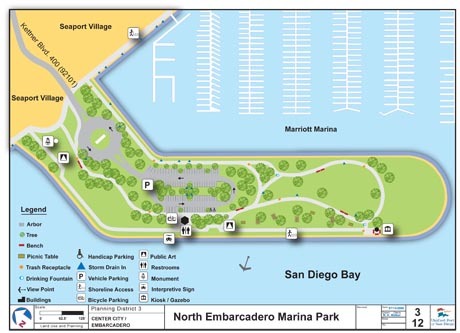 Location of Embarcadero Marina Park North. The park is connected to Seaport Village on a small peninsula next to the Marriott Marina. The end of Kettner Boulevard runs right into the park's parking lot. The park is within walking distance of downtown San Diego CA, San Diego Convention and many of the downtown area hotels. You can see its sister park, Embarcadero Marina Park South across a small body of water. The San Diego Trolley is a convenient way to get to the park. The park is also within walking distance of the Gaslamp Quarter. Maximum occupancy for events is 3,000. Dogs on leashes are permitted. Guideline apply.